To read Wife.Mother.Teacher's full review, or to find out what this means for the sports fan in your house, check out this post. Time for the giveaway - this giveaway will run for the month of April and is open to all US residents ages 18+. To enter please fill out the rafflecopter form below. I'm interested in a GoMohu antenna because it could save us money from not renting a cable box for our downstairs TV. I am interested in saving money on cable fees. I'm interested in a GoMohu antenna because my antenna does not get all channels. 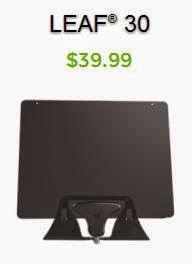 Why are you interested in the Leaf 30 antenna from Go Mohu? It seems like all my favorite shows are on network TV anyways so why pay for cable when I can get it for free with an antenna?! 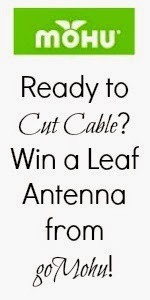 I am interested because I have been thinking about cutting the cable cord for a while! I am interested because Comcast got so expensive, and there is so much on regular TV.